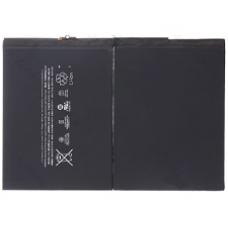 Replacement Apple iPad Air battery, this is a genuine original battery for your iPad Air rated at 8827 mAh. If your iPad Air battery no longer holds a charge like when new, or maybe the iPad Air battery discharges very quickly, if so you probably need to replace the internal battery to solve your iPad Air battery faults. Please note replacement of the iPad Air battery requires removal of the bonded touch screen. * Specification: 3.73V, 32.9Whr, 8827mAh.